At the 14th annual NCTO meeting, outgoing Chairman Robert H. Chapman III painted a picture of the U.S. textile industry, and the association’s achievements and upcoming goals. Editor’s Note: The North American Industry Classification System (NAICS) is the standard used by Federal statistical agencies in classifying business establishments for the purpose of collecting, analyzing, and publishing statistical data related to the U.S. business economy. NAICS Subsector 313 covers Textile Mills, subsector 314 covers Textile Product Mills and subsector 315 covers Apparel. The Chicago Cubs still had not won a World Series since 1908. How history went on to unfold reminds us of just how much change can occur in 12 months. And nowhere has change been more dramatic than in Washington. Unforeseen by most pollsters and pundits, the election of President Trump turned conventional political wisdom on its head and reignited debate on largely stagnant policy issues ranging from trade to tax and immigration reform. Consequently, if there was ever a time for the U.S. textile industry to fully marshal its resources and decisively engage in Washington, it is now. Thanks to the new Trump policy dynamic, the next 12 months represent the best opportunity in a generation to reorient U.S. manufacturing policy, level the playing field, and usher in a new era of growth for U.S. textile makers. Before delving into policy matters, however, a statistical recap of how the industry fared in 2016 is in order. Thanks to a laser-like focus on boosting productivity, flexibility, and innovation, the U.S. textile industry has cemented its position in the global market. 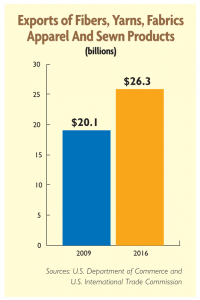 In 2016, the value of U.S. man-made fiber and filament, textile, and apparel shipments totaled an estimated $74.4 billion, an increase of 11 percent since 20091.
an estimated $7.4 billion for man-made fibers. Capital expenditures also are healthy. 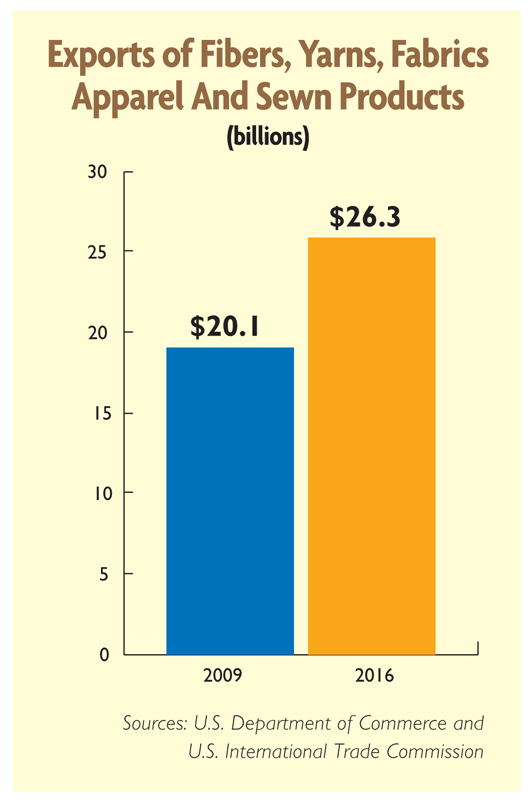 Investment in fiber, yarn, fabric, and other non-apparel textile product manufacturing has climbed from $960 million in 2009 to $1.7 billion in 2015 — an increase of 75 percent3. 52,500 jobs in wool growing and related industry. When examining these employment figures, it is important to note that the heavy job losses incurred because of massive import surges in the 1995-2008 timeframe, virtually have stopped5. Today, like most other U.S. manufacturing sectors, fluctuations in employment figures are generally due to normal business cycles, new investment, or productivity increases. 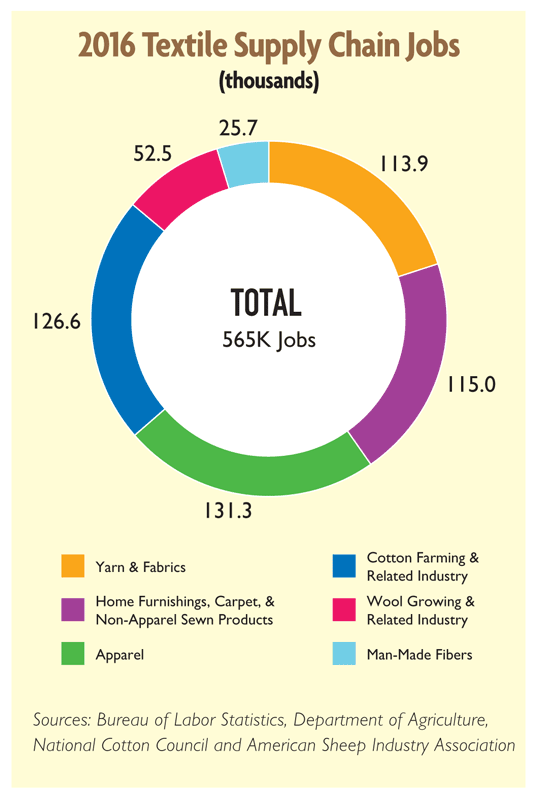 U.S. exports of fiber, yarns, fabrics, made-ups, and apparel were $26.3 billion in 20166. Shipments to NAFTA and CAFTA-DR countries accounted for 56 percent of all U.S. textile supply chain exports. The United States is especially well-positioned globally in fiber, yarn, fabric, and non-apparel sewn products markets; it was the world’s third largest individual country exporter of those products in 20157. $1.8 billion — Rest of World. $439 million — Dominican Republic. 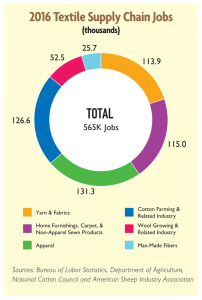 Wrapping up the numbers, the fundamentals for the U.S. textile industry remain sound. This is true even though the U.S. market for textiles and apparel was soft in 2016. For the most part, the sluggishness was due to factors beyond the industry’s control: an underperforming U.S. economy, a weak global economy, and disruption within the retail sector as sales shift from brick and mortar outlets to the internet. With that said, the U.S. textile industry’s commitment to capital reinvestment and a continued emphasis on quality and innovation make it well-positioned to adapt to market changes and take advantage of opportunities as 2017 moves along. Another cause for optimism is President Trump’s forceful call to reinvigorate domestic manufacturing. For decades, U.S. policy has undervalued domestic manufacturing’s importance to America, and President Trump is right to question whether this has been good for the country. Precisely because they will stimulate manufacturing and kick start job creation, NCTO enthusiastically endorses President Trump’s macro policy objectives of fighting for free, but fair trade, enforcing U.S. trade laws, making the U.S. tax code more internationally competitive, cutting unnecessary regulation, revitalizing infrastructure, buying American, ensuring cheap energy, and fixing health care. Drilling down to the details, NCTO agrees with President Trump that U.S. trade policy must be changed to reflect the reality of the twenty-first century economy for it to truly benefit a broad swath of American society. That is why NCTO supported President Trump’s executive action to withdraw the United States from the 12-country Trans-Pacific Partnership (TPP) even though NCTO had endorsed the agreement just one year earlier. customs provisions that capture the critical enforcement aspects of previous agreements. Noting that NCTO had leveraged its prospective support for TPP in return for the Obama administration securing these vital objectives, it was incumbent upon NCTO to be true its word and endorse TPP when the Obama administration kept its end of the bargain. The 2016 election of President Trump, however, brought about a dramatic change on trade. President Trump’s fundamental opposition to TPP allowed NCTO to revisit its position and communicate to his transition team soon after the election that NCTO supported withdrawal from TPP. Mindful that President Trump also had signaled interest in pursuing individual bilateral free trade agreements with TPP countries, NCTO further communicated opposition to any bilateral free trade agreement with Vietnam because of that country’s non-market economy and its demonstrated ability to disrupt the U.S. textile market. Unlike TPP, NCTO strongly supports NAFTA because it is a pillar upon which the U.S.-Western Hemisphere supply chain is built. At $11.5 billion combined, Mexico and Canada are the U.S. textile industry’s largest export markets. Moreover, Mexico provides a vital garment assembly capacity the United States largely lacks. That said, NCTO agrees with President Trump that NAFTA should be reviewed and can be improved. For example, NAFTA’s yarn-forward rule of origin contains loopholes like tariff preference levels (TPLs) that benefit third-party countries, such as China at the expense of U.S. industry. Closing them would boost U.S. textile production and employment. NCTO also strongly endorses President Trump’s call for much tougher trade enforcement. Trade deals grant lucrative duty-free preferences to importers, thereby creating significant enticements for would-be wrongdoers. Stopping customs fraud has the twofold benefit of filling Treasury Department coffers and encouraging more production in the NAFTA and DR-CAFTA regions. Without hesitation, the United States should focus more resources on customs enforcement to aggressively investigate those who purposely undervalue U.S. imports to avoid duties or who illegally circumvent U.S. free trade agreement rules of origin via third-country transshipment or through other fraudulent means. In addition, penalties for customs fraud must be certain, swift, and sufficient to deter this harmful, illegal activity. Also within the trade enforcement realm, NCTO supports U.S. Commerce Secretary Wilbur Ross’s proposal for the U.S. government to self-initiate anti-dumping and countervailing duty cases. Other helpful actions the U.S. government should take include continued rejection of China’s demand to be recognized as a market economy and cracking down on illegal currency undervaluation. One final trade priority is the enactment of a Miscellaneous Tariff Bill (MTB). NCTO strongly supports duty relief on manufacturing inputs that are unavailable domestically and do not compete with other U.S.-made products. That said, NCTO is concerned that the MTB process is being abused through the filing of hundreds of petitions on finished goods, particularly apparel. On principle, NCTO opposes MTBs on finished goods because they often compete with like products made with U.S. inputs. Duty reductions on finished textile items from any source can also undermine U.S. free trade agreements that grant duty relief through a yarn forward rule of origin. Moving on to tax policy, NCTO wholeheartedly agrees that the U.S. tax code is in dire need of reform to make it more competitive internationally. Lowering the corporate rate and allowing the immediate expensing of capital investment would be a significant benefit to NCTO members. NCTO is also carefully studying the border adjustable taxation issue. As a trade association representing U.S manufacturers and exporters, NCTO is keenly aware that foreign border tax schemes, including tax rebates to offshore competitors who export goods to our market, disadvantage U.S. producers. As such, NCTO is poised to engage congressional leadership when any detailed border adjustable taxation legislation is put forth to thoroughly understand how that proposal may impact the textile industry. NCTO is also pleased with President Trump’s initiative to cut unnecessary regulation and is encouraging its members to take advantage of the public comment period that closes on March 31 to submit ideas to improve the federal regulatory regime. Rebuilding America’s infrastructure is another NCTO priority. Besides boosting U.S. productivity and facilitating commerce, infrastructure is a growing market for textile products such as workwear, geomembranes, filtration systems, and composites for load-bearing systems. Fostering a national culture of innovation is important too. In that regard, NCTO urges President Trump to nurture the Advanced Functional Fabrics of America (AFFOA) project. This defense department program is matched three to one with private dollars and tasked with making it easier to develop and commercialize the next generation of high-performance textiles. With respect to government procurement policy, NCTO is proud of its steadfast efforts to defend and strengthen the Berry Amendment. This “buy American” provision for the military is an excellent example of how the government and the private sector can work together to the benefit of one another. The U.S. military benefits from guaranteed access to a secure U.S. supply line for thousands of superior, highly-advanced products. In return, the domestic textile sector receives $1.5 to $2 billion in annual Defense Department sales that boost U.S. investment and employment. Noting that the Trump administration and Congress appear serious about wanting to buy more American, NCTO would aggressively work to make sure textiles are included in any effort to enact common sense laws or regulations that would strengthen “buy American” requirements applying to infrastructure or other federal spending. As demonstrated by Berry, when the federal government buys American, it is good for the U.S. textile industry and even better for America. Another NCTO priority is ensuring that the U.S. textile industry has uninterrupted access to reasonably priced energy. Most man-made fibers are derivatives of petroleum products. In addition, many textile producers are reliant on natural gas to power manufacturing operations. Noting this, NCTO strongly supports construction of expanded oil and gas pipeline capacity to keep energy prices low. Finally, the U.S. textile industry must acknowledge that its most valuable resource, its workforce, is aging. To keep thriving long term, American textile manufacturing must recruit a new generation of talented chemists, designers, engineers, skilled technicians and semi-skilled labor. To this end, U.S. companies must continue to forge links with local leaders, schools, and government, vocational programs, community colleges, universities, and state business lobbies to make sure that state and federal policy produces a labor pool both adequate in size and well prepared to succeed in a hyper-competitive global economy. The industry’s need to attract America’s best and brightest is one reason why NCTO embarked upon the “American Textiles: We Make Amazing” rebranding campaign two years ago. NCTO is pleased to report the campaign is slowly, but surely, challenging outdated perceptions of the U.S. textile sector thanks to the fact that American textile manufacturers have a great story to tell. America’s textile industry is world class thanks to leveraging the most cutting-edge production processes, investing in the best machinery, and leading in sustainability and innovation. Judging by the earned media and social engagement generated by “American Textiles: We Make Amazing” marketing efforts, more and more people are hearing the good news and viewing the U.S. textile industry in a new light. Although the U.S. textile industry has stabilized its position in the global economy, it cannot afford to rest on its laurels. There will always be intense and sometimes unfair competition from abroad, changing consumer demands and inevitable economic downturns. Again, that is why it is so important for the U.S. textile industry to seize this generational moment to influence federal policies if it wants to usher in a new era of growth. With so much at stake in the next twelve months, members of NCTO and other textile trade associations must stay actively involved in their respective organizations. Moreover, all domestic textile manufacturers who have not been active in Washington, but are serious about wanting a seat at the table to change textile policy for the better, are invited to join NCTO. Good policy does not materialize from thin air, and NCTO must be well financed to affect the changes that will give our sector the best chance to build a stable and prosperous future for U.S. textile companies. That’s a long way of saying the U.S. textile sector’s great workers and their families and communities are depending on the leadership of the industry’s leaders. 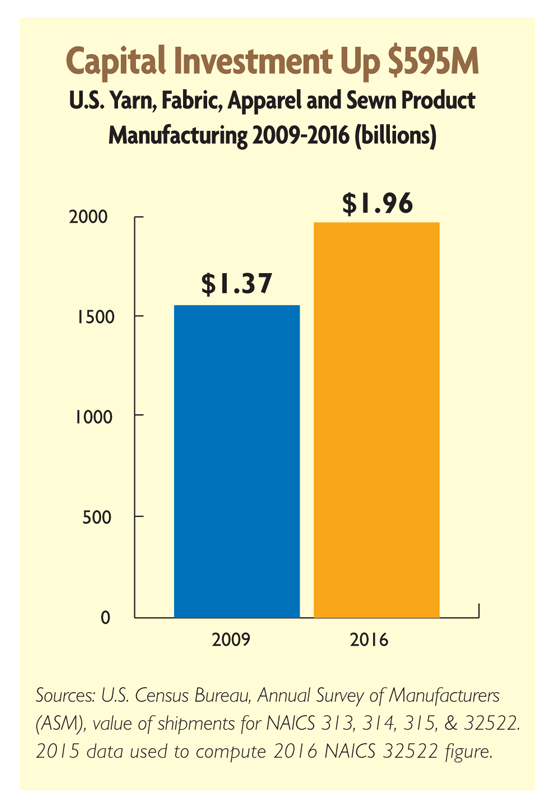 Source: U.S. Census Bureau Annual Survey of Manufactures (ASM). Data covers NAICS categories 313 (Textile Mills), 314 (Textile Product Mills), 315 (Apparel), and 32522 (Artificial and Synthetic Fibers and Filaments). 2016 Data for NAICS 32522 is not yet available. Our 2016 estimate for the value of shipments in that category is $7.4 billion. 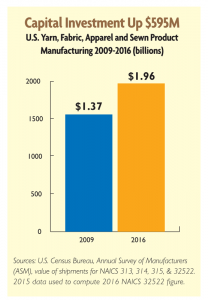 Source: U.S. Census Bureau Annual Survey of Manufactures (ASM). Data covers NAICS categories 313 (Textile Mills), 314 (Textile Product Mills), 315 (Apparel), and 32522 (Artificial and Synthetic Fibers and Filaments). 2016 Data for NAICS 32522 is not yet available. Our estimate for the value of shipments in that category is based on data from 2015. Source: U.S. Census Bureau, Annual Capital Expenses Survey (ACES). Data covers NAICS categories 313 (Textile Mills), 314 (Textile Product Mills), and 315 (Apparel). Sources: U.S. Bureau of Labor Statistics, U.S. Department of Agriculture, National Cotton Council, and the American Sheep Industry Association. Source: Data for textiles and apparel is from The Export Market Report produced by the U.S. Department of Commerce, Office of Textiles and Apparel (OTEXA). U.S. export data for cotton, wool, and fine animal hair is calculated from the U.S. International Trade Commission Interactive Tariff and Trade DataWeb using HTS Codes 5101, 5102, 5103 (wool), 5201, 5202, and 5203 (cotton). The top 4 exports markets by country for the entire textile supply chain are (1) Mexico – $6.3 billion, (2) Canada – $5.2 billion, (3) China, Hong Kong and Macau – $1.8 billion, and (4) Honduras – $1.5 billion respectively. Editor’s Note: Robert H. Chapman III is chairman and CEO of Inman, S.C.-based Inman Mills. He served as the 2016-17 NCTO chairman. At the recent annual meeting in Washington, William V.McCrary Jr., chairman and CEO of Spartanburg-based William Barnet and Son LLC, succeeded Chapman as NCTO chairman for 2017-18.